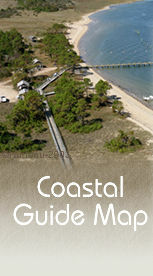 The clickable map below represents the area of North Carolina's coast covered in some way within the pages of CarolinaOuterBanks.com. Obviously there are cities and features included here which are not actually "on" the Outer Banks. But just as the history, folklore and legend of these barrier islands are so inextricably intertwined, it is equally difficult to separate much of the surrounding maritime area from inclusion. For example, Bath, the first town in North Carolina, was once home to Edward Teach, better known as Blackbeard. His flagship, the "Queen Anne's Revenge", was scuttled in the early 1700's near Beaufort, where its remains were discovered in 1996 in Beaufort Inlet. Blackbeard was killed in 1718 in a Naval battle near Ocracoke. So it goes, each small bit of history, legend or folklore leads the curious explorer from one location to another. Although the water of the sounds and rivers separates the barrier islands from the mainland coastline, it has always served just as surely to connect them. Anyone who explores the Outer Banks will eventually find themselves visiting other places all along the coastline. Click on the map's hot spots and jump to web pages on the subject, or try this larger, easier to read zoomable version of the map in PDF format. Then explore North Carolina's Outer Banks through the rest of this site, and discover something beautiful and interesting for yourself.